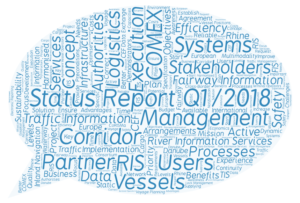 The focus within RIS COMEX in the first quarter of 2018 was clearly put on the draft finalisation of the service definitions and the further elaboration of the system architecture that shall enable the realisation of the defined services in the upcoming years within Activity 3 of the project. Besides several workshops related to the above-mentioned tasks, the Activity 4 Kick-Off meeting also took place in the first quarter of 2018 (17th January in Vienna) where the detailed planning, approach, responsibilities and expected results of Activity 4 were discussed and agreed. By the way, Activity deals with the establishment of all necessary frameworks (legal, organisational, financial, etc.) in order to ensure a proper transformation of the implemented services into sustainable operation by the end of project. By the end of March the Action Status Report 2018 (for the reporting period 2017) containing details about the technical and financial progress was submitted. To give a short outlook, the main challenge within the second quarter 2018 will be to finalise the service definitions and the system architecture and come to an agreement concerning the implementation plan (what services will be realised within Activity 3 in which specific Corridors).